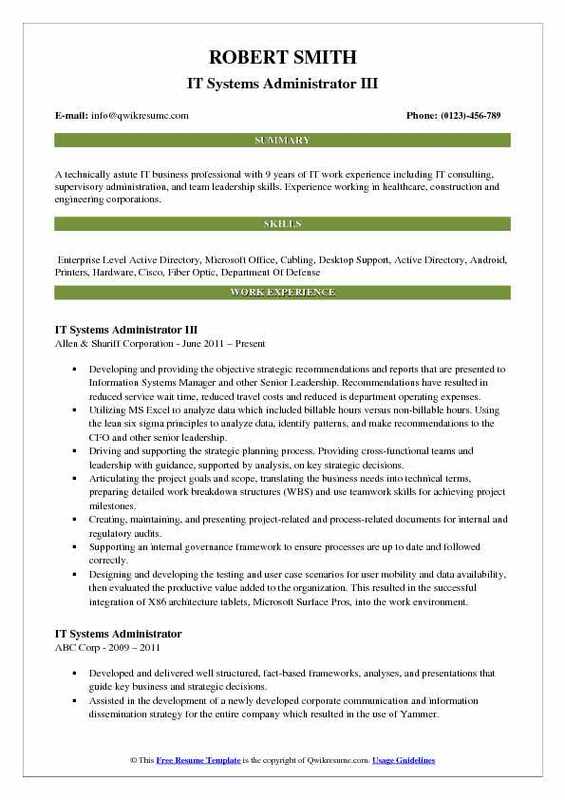 As an IT Systems Administrator, the candidate will be responsible for maintaining the IT network, security systems, and servers of the company. 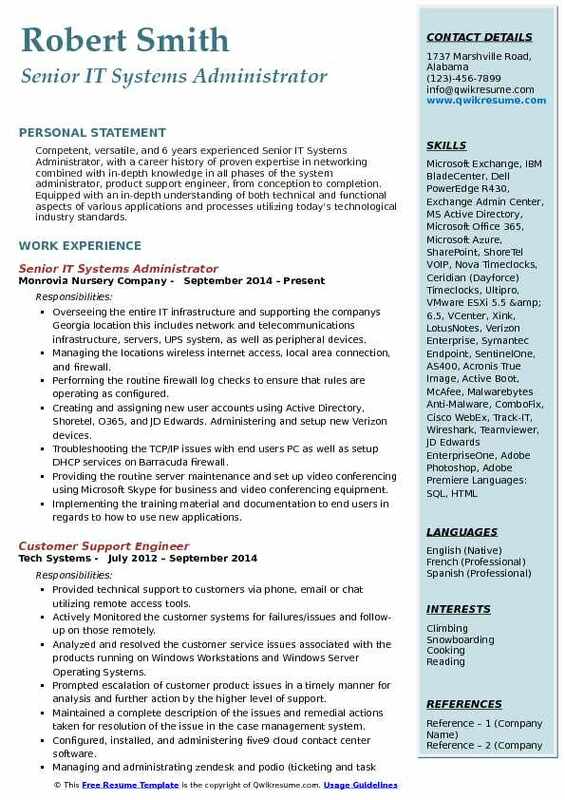 Some of the day-to-day tasks mentioned in the IT Systems Administrator Resume include – installing and configuring software and hardware, managing network servers, setting up workstations and accounts, monitoring performance and maintaining systems, troubleshooting issues, and outages, upgrading systems, ensuring safety, training staff on new technologies and making recommendations for improving IT system of the company. 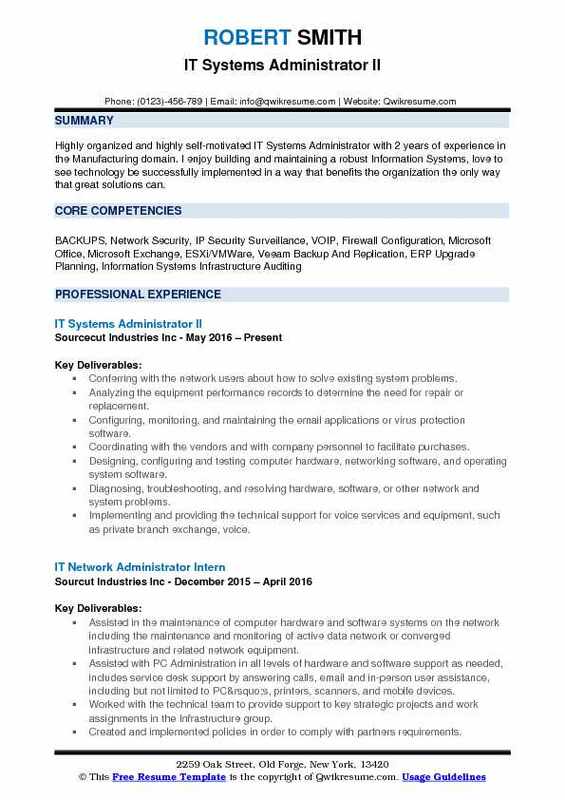 Candidates possessing the following qualifications earn better job prospects – IT Systems administrator expertise, experience with system security, experience with networks and databases, knowledge of system security and data recovery, ability to create scripts in various languages, and familiarity with various OS and Platforms. 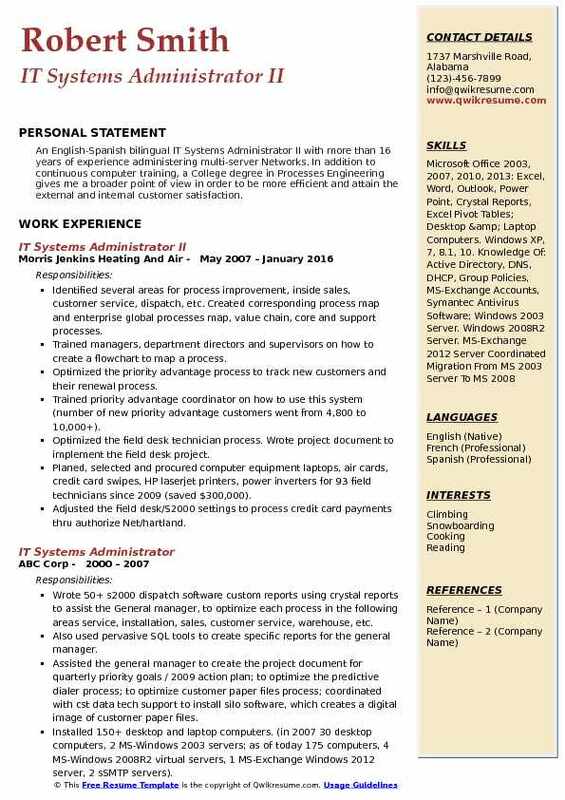 There isn’t a single route to becoming an IT Systems Administrator, but more often, successful resumes depict a degree in the related subject such as IT, computer science or Computer engineering. 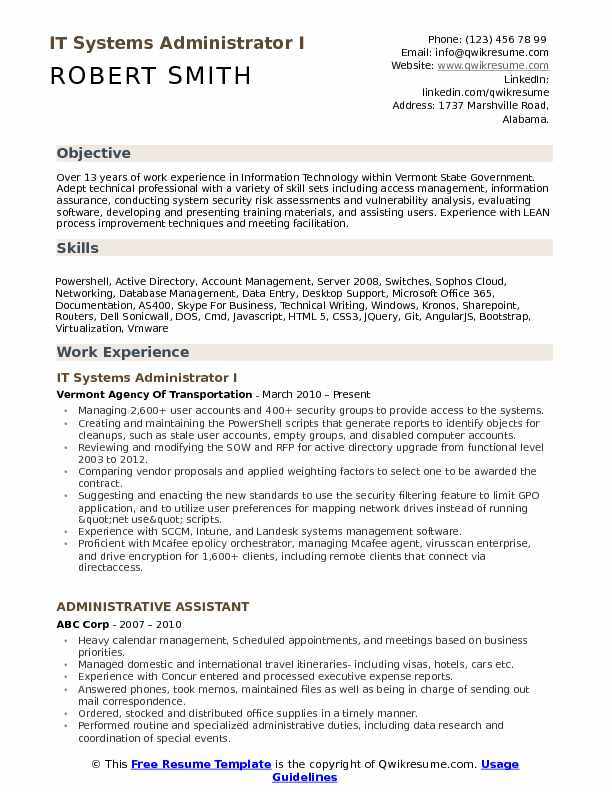 Summary : Over 13 years of work experience in Information Technology within Vermont State Government. Adept technical professional with a variety of skill sets including access management, information assurance, conducting system security risk assessments and vulnerability analysis, evaluating software, developing and presenting training materials, and assisting users. Experience with LEAN process improvement techniques and meeting facilitation. Managing 2,600+ user accounts and 400+ security groups to provide access to the systems. Creating and maintaining the PowerShell scripts that generate reports to identify objects for cleanups, such as stale user accounts, empty groups, and disabled computer accounts. Reviewing and modifying the SOW and RFP for active directory upgrade from functional level 2003 to 2012. Comparing vendor proposals and applied weighting factors to select one to be awarded the contract. Suggesting and enacting the new standards to use the security filtering feature to limit GPO application, and to utilize user preferences for mapping network drives instead of running "net use" scripts. Experience with SCCM, Intune, and Landesk systems management software. Proficient with Mcafee epolicy orchestrator, managing Mcafee agent, virusscan enterprise, and drive encryption for 1,600+ clients, including remote clients that connect via directaccess. Saving the agency over $6,000 by performing client migrations and two EPO upgrades, as opposed to hiring an outside consultant to complete the work. Experience with Malwarebytes management console, anti-malware, and anti-exploit software. Managing the Microsoft updates via WSUS console, ensuring all domain computers are patched. Creating, maintaining and verifying backup jobs using Symantec backup exec software. Working with the versions 2010 R3, 2014, and 2015. Saved the agency over $1,800 by reviewing license entitlements before renewal and making recommendations to remove software options that are no longer used or needed. 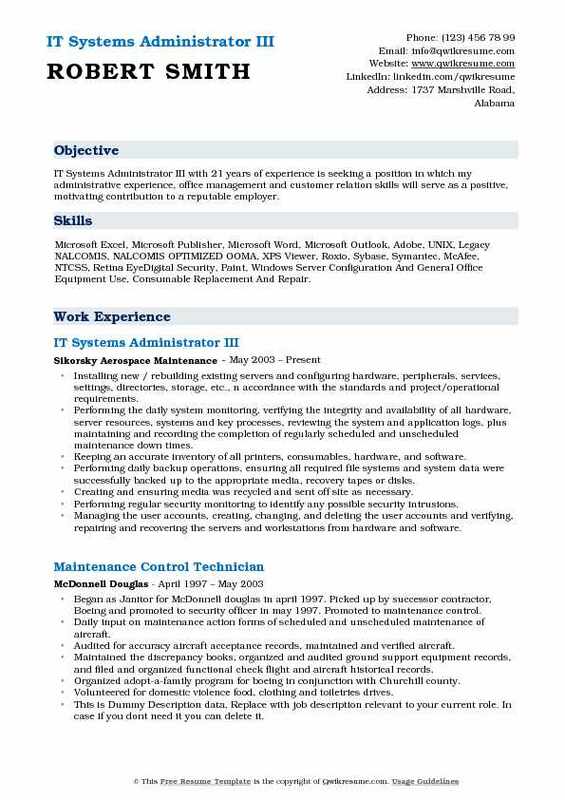 Objective : Highly organized and highly self-motivated IT Systems Administrator with 2 years of experience in the Manufacturing domain. I enjoy building and maintaining a robust Information Systems, love to see technology be successfully implemented in a way that benefits the organization the only way that great solutions can. Conferring with the network users about how to solve existing system problems. Analyzing the equipment performance records to determine the need for repair or replacement. Configuring, monitoring, and maintaining the email applications or virus protection software. Coordinating with the vendors and with company personnel to facilitate purchases. Designing, configuring and testing computer hardware, networking software, and operating system software. Diagnosing, troubleshooting, and resolving hardware, software, or other network and system problems. Implementing and providing the technical support for voice services and equipment, such as private branch exchange, voice. Loading the computer tapes and disks, and installing software and printer paper or forms. Maintaining and administering the computer networks and related computing environments including computer hardware. Maintaining the logs related to network functions, as well as maintenance and repair records. Monitoring the network performance to determine whether adjustments need to be made, and to determine where the changes will need to be made in the future. Summary : A technically astute IT business professional with 9 years of IT work experience including IT consulting, supervisory administration, and team leadership skills. Experience working in healthcare, construction and engineering corporations. Developing and providing the objective strategic recommendations and reports that are presented to Information Systems Manager and other Senior Leadership. Recommendations have resulted in reduced service wait time, reduced travel costs and reduced is department operating expenses. Utilizing MS Excel to analyze data which included billable hours versus non-billable hours. Using the lean six sigma principles to analyze data, identify patterns, and make recommendations to the CFO and other senior leadership. Driving and supporting the strategic planning process. Providing cross-functional teams and leadership with guidance, supported by analysis, on key strategic decisions. Articulating the project goals and scope, translating the business needs into technical terms, preparing detailed work breakdown structures (WBS) and use teamwork skills for achieving project milestones. Creating, maintaining, and presenting project-related and process-related documents for internal and regulatory audits. Supporting an internal governance framework to ensure processes are up to date and followed correctly. Designing and developing the testing and user case scenarios for user mobility and data availability, then evaluated the productive value added to the organization. This resulted in the successful integration of X86 architecture tablets, Microsoft Surface Pros, into the work environment. 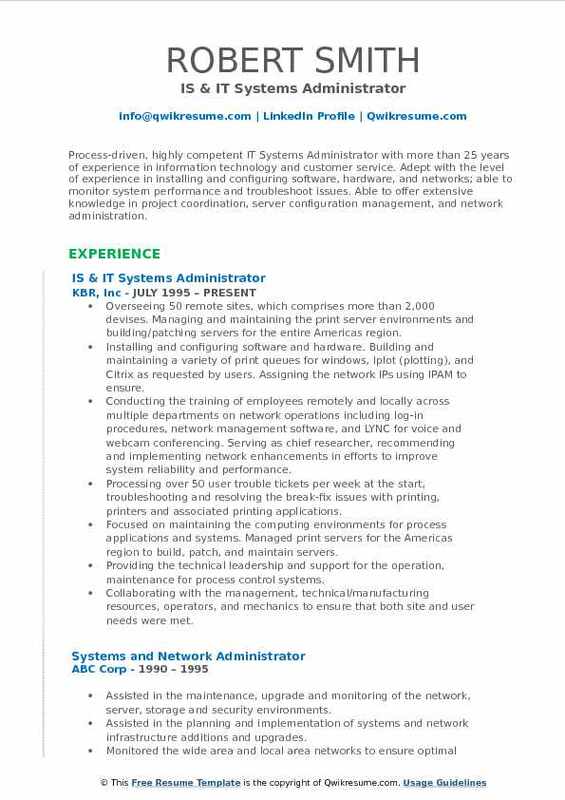 Summary : Process-driven, highly competent IT Systems Administrator with more than 25 years of experience in information technology and customer service. Adept with the level of experience in installing and configuring software, hardware, and networks; able to monitor system performance and troubleshoot issues. Able to offer extensive knowledge in project coordination, server configuration management, and network administration. Overseeing 50 remote sites, which comprises more than 2,000 devises. Managing and maintaining the print server environments and building/patching servers for the entire Americas region. Installing and configuring software and hardware. Building and maintaining a variety of print queues for windows, Iplot (plotting), and Citrix as requested by users. Assigning the network IPs using IPAM to ensure. Conducting the training of employees remotely and locally across multiple departments on network operations including log-in procedures, network management software, and LYNC for voice and webcam conferencing. Serving as chief researcher, recommending and implementing network enhancements in efforts to improve system reliability and performance. Processing over 50 user trouble tickets per week at the start, troubleshooting and resolving the break-fix issues with printing, printers and associated printing applications. Focused on maintaining the computing environments for process applications and systems. Managed print servers for the Americas region to build, patch, and maintain servers. Providing the technical leadership and support for the operation, maintenance for process control systems. Collaborating with the management, technical/manufacturing resources, operators, and mechanics to ensure that both site and user needs were met. Providing the software support for various technology ranges in the Distributed control systems (DCS), including servers, switches, cybersecurity elements, and database applications. 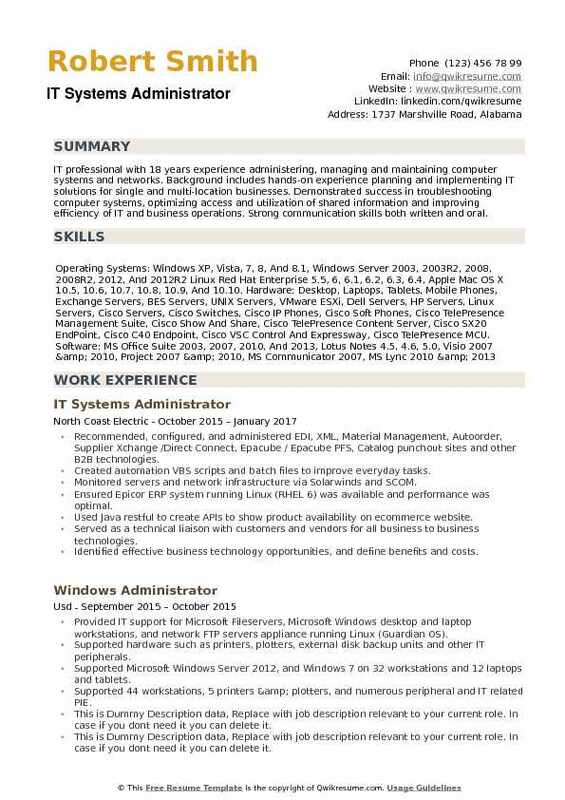 Headline : Competent, versatile, and 6 years experienced Senior IT Systems Administrator, with a career history of proven expertise in networking combined with in-depth knowledge in all phases of the system administrator, product support engineer, from conception to completion. Equipped with an in-depth understanding of both technical and functional aspects of various applications and processes utilizing today's technological industry standards. Overseeing the entire IT infrastructure and supporting the company's Georgia location this includes network and telecommunications infrastructure, servers, UPS system, as well as peripheral devices. Managing the location's wireless internet access, local area connection, and firewall. Performing the routine firewall log checks to ensure that rules are operating as configured. Creating and assigning new user accounts using Active Directory, Shoretel, O365, and JD Edwards. Administering and setup new Verizon devices. Troubleshooting the TCP/IP issues with end users PC as well as setup DHCP services on Barracuda firewall. Providing the routine server maintenance and set up video conferencing using Microsoft Skype for business and video conferencing equipment. Implementing the training material and documentation to end users in regards to how to use new applications. Successfully configured 4 Barracuda firewalls for site-to-site VPN connections to remote locations to allow access to company local network. Enabled DHCP service on each of the firewalls so that it automatically assigns IPs for all network equipment connected to the HP switch. Transitioning the entire location to New Ceridian time system and provided live training to end users on how to use the new system. Summary : IT Systems Administrator III with 21 years of experience is seeking a position in which my administrative experience, office management and customer relation skills will serve as a positive, motivating contribution to a reputable employer. Skills : Microsoft Excel, Microsoft Publisher, Microsoft Word, Microsoft Outlook, Adobe, UNIX, Legacy NALCOMIS, NALCOMIS OPTIMIZED OOMA, XPS Viewer, Roxio, Sybase, Symantec, McAfee, NTCSS, Retina EyeDigital Security, Paint, Windows Server Configuration And General Office Equipment Use, Consumable Replacement And Repair. Installing new / rebuilding existing servers and configuring hardware, peripherals, services, settings, directories, storage, etc., n accordance with the standards and project/operational requirements. Performing the daily system monitoring, verifying the integrity and availability of all hardware, server resources, systems and key processes, reviewing the system and application logs, plus maintaining and recording the completion of regularly scheduled and unscheduled maintenance down times. Keeping an accurate inventory of all printers, consumables, hardware, and software. Performing daily backup operations, ensuring all required file systems and system data were successfully backed up to the appropriate media, recovery tapes or disks. Creating and ensuring media was recycled and sent off site as necessary. Performing regular security monitoring to identify any possible security intrusions. Managing the user accounts, creating, changing, and deleting the user accounts and verifying, repairing and recovering the servers and workstations from hardware and software. Coordinating and communicating with impacted constituencies and provided technical support. Summary : Dynamic personality with excellent presentation skills Accomplished, achievement driven and results orientated Familiarity with accounting, bookkeeping and legal documentation Team leader, detail orientated, able to multitask Ability to maintain employee and customer satisfaction as well as meeting company objectives Bilingual- fluent Spanish Excellent at prioritizing issues in a fast paced environment Computer hardware, server & software specialist. Assisting in the support of all production hardware, 90+ software programs as well as application systems. Providing 24/7 support - primary go-to person for all hardware and software related issues reported by Attorneys and Staff. Maintaining window servers, Citrix servers, VMware servers, file servers, print servers, VPN gateways and phone systems, PDAs, desktops, laptops, MFDs, HP and Xerox multifunctional device printers. Planning the required maintenance of all servers, desktops, laptops, hardware, software and networks to provide a stable and reliable environment. Making the recommendations for network, hardware and software upgrades, budgeting and purchasing. Analyzing, supporting and isolating the issues quickly and efficiently while making recommendations for inner network and firm infrastructure. Imaging laptop and desktops, setup users, relocating and deploying the computers to employees. Monitoring the networks to ensure security and availability to specific users. Traveling to Attorney's personal home offices to troubleshoot issues, install and update software, setup printers, laptops, pc desktops and MACs. Working closely with firm's Tech Committee and firm's Shareholders to recommend changes for the growth of firm systems, infrastructure and software. Setting up the conference and courtrooms with audio/video, presentation software, network and computer technologies. Summary : IT Systems Administrator IV with 30 plus years of experience in the Technology domain is seeking to obtain a position in the Information Technology field and the possibility of career advancement. Skills : MCTS, New Horizons Computer Learning Center, Tucson AZ 2009. Implementing And Maintaining Microsoft SQL Server 2008 Reporting Services, New Horizons Computer Learning Center, 2013. VMware VSphere 5, Hyper-V, Network Administration- IBM Of Mexico DF, OLC LA. Interconnecting Cisco Networking Devices- University Of Arizona, Dell, HP, IBM Servers. Installed, configured, and supported commercial data corporation's local area network (LAN), wide area network (WAN), and internet systems. Monitored network to ensure network availability to all system users and performed necessary maintenance to support network availability. Monitored and tested website performance to ensure websites operated correctly and without interruption. Assisted in network modeling, planning, and coordination between network and data communications hardware and software. Supervised computer user support specialists and computer network support specialists. Experience as a courier delivering doctors statements to clients for Commercial Data Corporation (CDC) for 2 years. Assisted in network planning, installation and coordination of network and data communications hardware and software for the cdc office. Installed and maintained system software, various versions of Windows for desktops and servers. Installed multiple operating systems--Redhat enterprise servers up to version 5. Experience with using Sperry minicomputer running Unix. Installed and maintained all computers and related equipment for cdc office and administered security measures. Installed and maintained high-speed Dot Matrix, Ink Jet, and laser printers. Printed payroll checks, W2s, 1099 forms and custom client reports as requested. Ordered all equipment, forms, supplies, and software needed to maintain the CDC office. 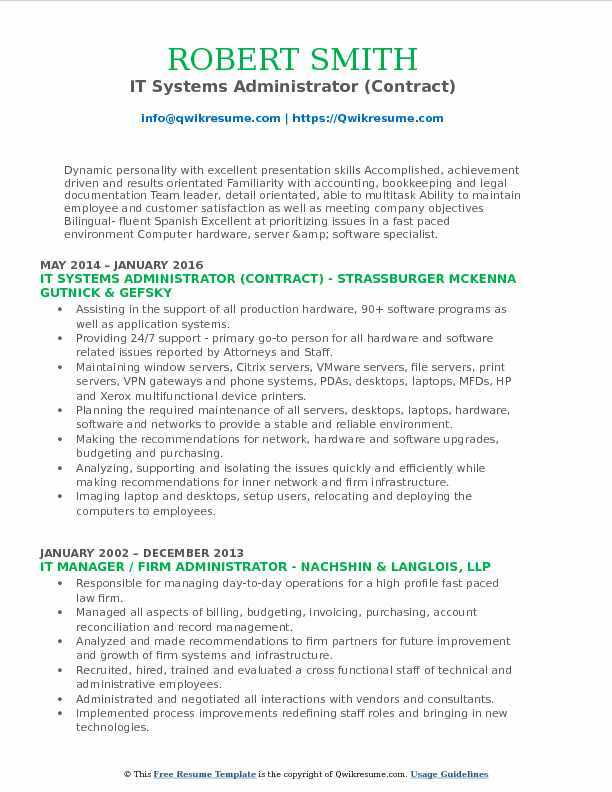 Summary : An English-Spanish bilingual IT Systems Administrator II with more than 16 years of experience administering multi-server Networks. In addition to continuous computer training, a College degree in Processes Engineering gives me a broader point of view in order to be more efficient and attain the external and internal customer satisfaction. Identified several areas for process improvement, inside sales, customer service, dispatch, etc. Created corresponding process map and enterprise global processes map, value chain, core and support processes. Trained managers, department directors and supervisors on how to create a flowchart to map a process. Optimized the priority advantage process to track new customers and their renewal process. Trained priority advantage coordinator on how to use this system (number of new priority advantage customers went from 4,800 to 10,000+). Optimized the field desk technician process. Wrote project document to implement the field desk project. Planed, selected and procured computer equipment: laptops, air cards, credit card swipes, HP laserjet printers, power inverters for 93 field technicians since 2009 (saved $300,000). Adjusted the field desk/S2000 settings to process credit card payments thru authorize Net/hartland. Otimized the process to track customer location and show sales/install/service revenue by colored zip code areas. Optimized the use of conference rooms with ms-exchange for managers/supervisors meetings. Installed 150+ desktop and laptop computers. (in 2007: 30 desktop computers, 2 MS-windows 2003 servers: 175 computers, 4 MS-windows 2008R2 virtual servers, 1 ms-exchange windows 2012 server, 2 smtp servers); installed windows (XP, 7, 8. 1, 10), Symantec antivirus, and Kaseya software on these computers. Assisted Mr. Jenkins to select and acquire Avaya IP telephone system, coordinated with Telware tech personnel the installation of this system in the main building and the redundant system in the service building, configured telephone set extension numbers. Wrote project document to track project progress. 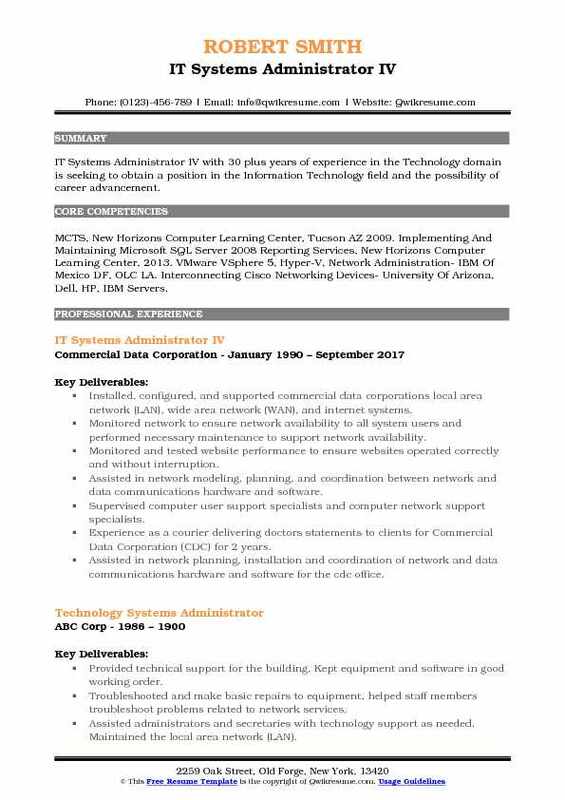 Summary : IT professional with 18 years experience administering, managing and maintaining computer systems and networks. Background includes hands-on experience planning and implementing IT solutions for single and multi-location businesses. Demonstrated success in troubleshooting computer systems, optimizing access and utilization of shared information and improving efficiency of IT and business operations. Strong communication skills both written and oral. Recommended, configured, and administered EDI, XML, Material Management, Autoorder, Supplier Xchange /Direct Connect, Epacube / Epacube PFS, Catalog punchout sites and other B2B technologies. Created automation VBS scripts and batch files to improve everyday tasks. Monitored servers and network infrastructure via Solarwinds and SCOM. Ensured Epicor ERP system running Linux (RHEL 6) was available and performance was optimal. Used Java restful to create APIs to show product availability on ecommerce website. Served as a technical liaison with customers and vendors for all business to business technologies. Identified effective business technology opportunities, and define benefits and costs. Maintained required availability, reliability and performance levels for the advanced partner technology. Worked independently and with other members of the support information technology group and external providers to develop, and deploy apt solutions. Responsible for stable and performant operations of enterprise's Windows and Linux systems, providing primary response for systems issues. Responsible for ensuring reliability, performance and availability of critical systems. Responsible for ensuring stable implementation and operation of IT business continuity plans for enterprise systems.